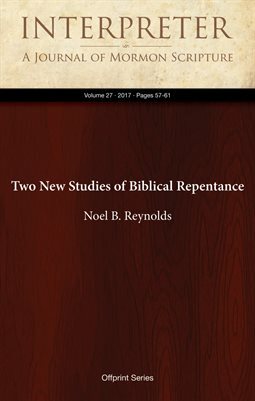 Review of Mark J. Boda, ‘Return to Me:’ A Biblical Theology of Repentance, volume 35 of New Studies in Biblical Theology, ed. by D. A. Carson (Downers Grove, IL: InterVarsity Press, 2015), 198 pp. plus bibliography, author index, and scripture index ($24, paper); and of David A. Lambert, How Repentance Became Biblical: Judaism, Christianity, and the Interpretation of Scripture (New York: Oxford University Press, 2016), 224 pp. plus bibliography and indices of primary sources and subjects ($74, hardcover).